Henry Dryer the Third (later Dryerre), the subject of this contribution to Electric Scotland, was the first of six children born to Henry Dryer the Second (Tailor and Soldier) [born in 1823 in Ireland to Henry Dryer the First (Tailor) and Bridget Finn] ...... and Mary Gavin [born in 1827 in Edinburgh]. Henry Dryer the Second and Mary Gavin married in Edinburgh in 1847. 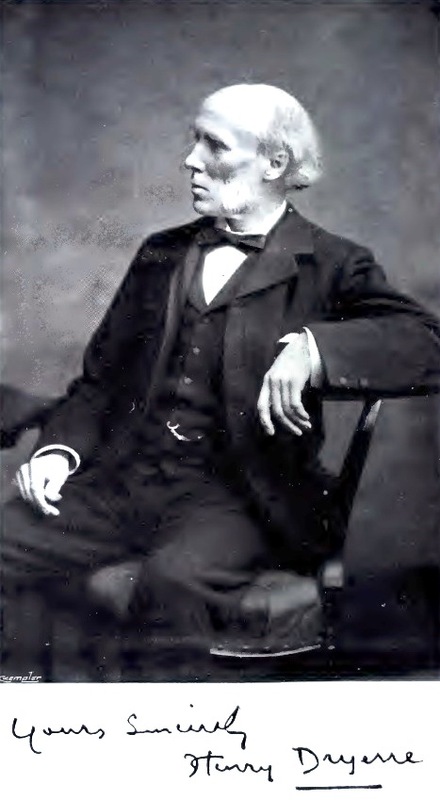 Henry Dryer the Third (by then Dryerre) married Jessie Meldrum in Perth in June, 1876, and they had two children in the 1880s, Henry Dryerre the Fourth, and Dora Dryerre. 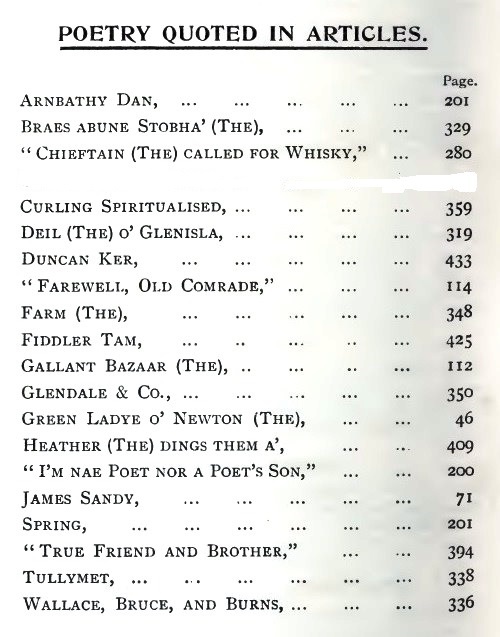 Jessie died in Blairgowrie in 1903, aged 55 years. 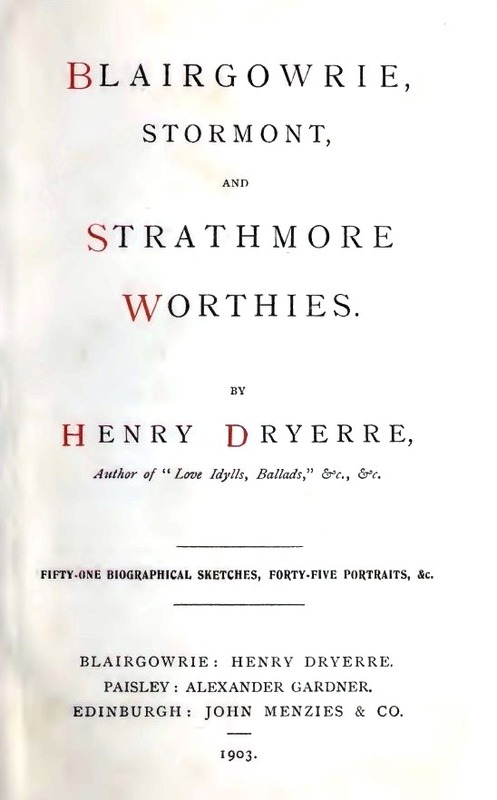 By Robert Ford in 1903 as an introduction to Mr Dryerre’s book called, “Blairgowrie and Strathmore Worthies”. Mr Dryerre is a gentleman, indeed, of whom all who know him intimately are bound to speak well; and so various are his gifts, and so true is it that he touches no art which he does not adorn that, since he came before the public many years ago, he has been a man of distinct mark in the wide and populous community in which he resides. For any man particularly to enter Blairgowrie as the friend of Henry Dryerre it means that he shall have a hearty welcome to every fireside. But such is no marvel. The wonder would be rather were it otherwise; for, in Blair, he is associated with every good work, and with every scheme which aims at the amelioration of the multitude. Unobtrusively, and without show, yet grudging no effort, he is, indeed, a genuine lover of his kind, who is striving constantly to discover what is best in everybody; believing as he does, and as I have heard him say, that every soul on earth is better than he or she appears, and deserves better than he or she gets. But it is less of his graces than of his gifts that we have to treat in this limited space, and so manifold are the latter that even they must be named without elaboration; for to state the few things which Mr Dryerre cannot do, or has not attempted, were an easier task than to enumerate all that he has set his mind to and done well. And, besides, the reader will desire to know something of his personal career. Well, then, be it known by all whom it may concern that Mr Dryerre, though of Scottish birth and breeding, is of Irish extraction, on the male side of the house. He was born in the Lawnmarket of Edinburgh, on the 16th of April 1848. Ten years later his father joined the 72nd Highlanders, and the family removed to Aberdeen, from which town in a short time they went with the regiment to India. In India Henry commenced his apprenticeship as a compositor in the regimental printing office, of which, and its associations, he cherishes in this hour many pleasing as well as some exciting memories. Before he had time to master the intricacies of his adopted handicraft, his father (in 1863) was invalided home, and the family moved with him and settled down in Perth, Henry finished his " time" there in the Old Ship Close with Mr Robert Whittet, printer and poet, now, and for many years, of Richmond,Va., North America, about whom, he says, he never met a more sympathetic, tenderhearted, and considerate master, or one with purer and loftier aspirations, and with more ability to fulfil them. 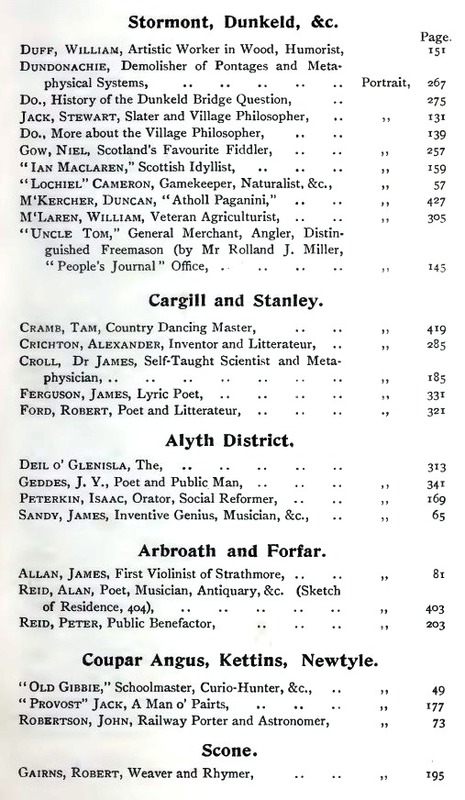 “He was virtually a father to his boys,” says Mr Dryerre, “and I am one of the boys yet, corresponding with him regularly.” Two who were his fellow-apprentices are Mr William Young, Carrick House, Barnhill, Perth, for many years manager to Mr Leslie, printer, Perth; and Mr Robert Donn, manager of the news printing department of Messrs John Leng & Co., Dundee. In Perth, besides, in his early career, he became happily associated with the Evangelical Union, or Morisonian body, under the Rev. William Adamson (now Dr Adamson, of Windermere), a man of great dialectical ability, who has encountered Bradlaugh and Holyoake, and other giants of debate on public platforms. Mr Adamson conducted a theological class regularly every winter, in which such high themes as “The Fatherhood of God,” the “Origin of Evil,” and Universal Redemption,” were discussed and debated; and to this connection he traces much of the distinctly metaphysical bent which is one of his strong characteristics. 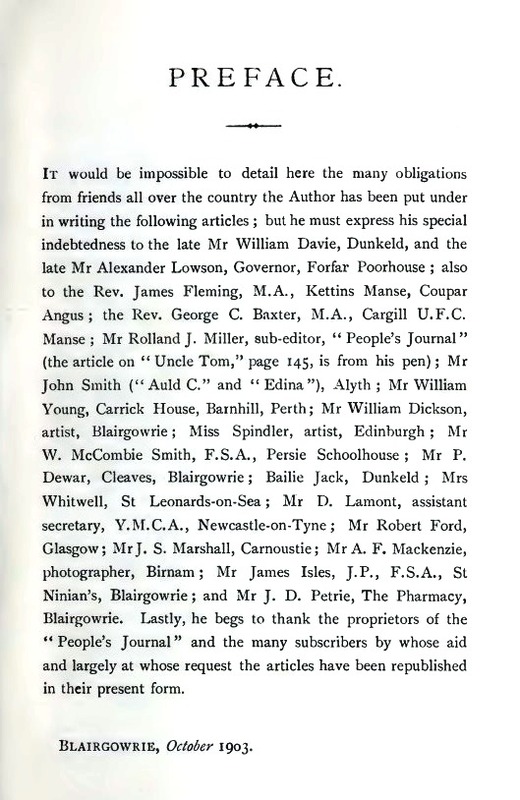 He owes much also to Dr Adamson's successor, the Rev. Robert Finlay, the present amiable pastor of what is is known now as the Congregational Church, Perth. From 1870 to 1874 Mr Dryerre was in London, where after working for a time "at the case," he acted as head reader on a daily newspaper. Night work, however, acted injuriously on his health, and necessitated his returning home. Resuming work in the Fair City, he occupied his spare hours in writing poems, tales, and sketches for the press and in teaching music and perfecting his knowledge of the French, Latin, and Greek languages. Here also he wooed and won his fair, dear, and ever bright wife, Miss Jessie Meldrum, a native of Wolfhill, the sad loss of whom in 1903, after a lingering illness, he was recently called upon to face—a loss which must have proved a trial about as sore as he was able to endure, for how much they were to each other only themselves and their very intimate friends and their Creator knew. Removing thither in 1878, Mr Dryerre has now been exactly a quarter of a century in Blairgowrie, where most of that time he has been established in business as a music-seller and stationer, but where, in addition he has been a teacher of music, shorthand, and languages: has made occasional violins (he plays the violin and 'cello); acted as reporter for the "Dundee Advertiser," "People's Journal," and other papers—writing sketches, poems, and stories for monthly and weekly periodicals, composing songs and setting them to music, &c. His active mind and ready hand, indeed, have been kept constantly busy, and he has found his rest only in change of occupation. For many years—if not so still—he acted as Secretary for the Blairgowrie Horticultural Society. For a like period he has been Vice-President of the local Choral Society. From 1878 till 1886 he acted as precentor, and with much acceptance in the Parish Church of Kettins, walking or cycling to and fro every Sabbath. Of the opera “Dora,” that was produced in Blairgowrie a number of years ago, and has been performed before delighted audiences elsewhere, he was sole librettist, as well as joint composer with the genial and by no means slightly gifted Mr George Macdomald. 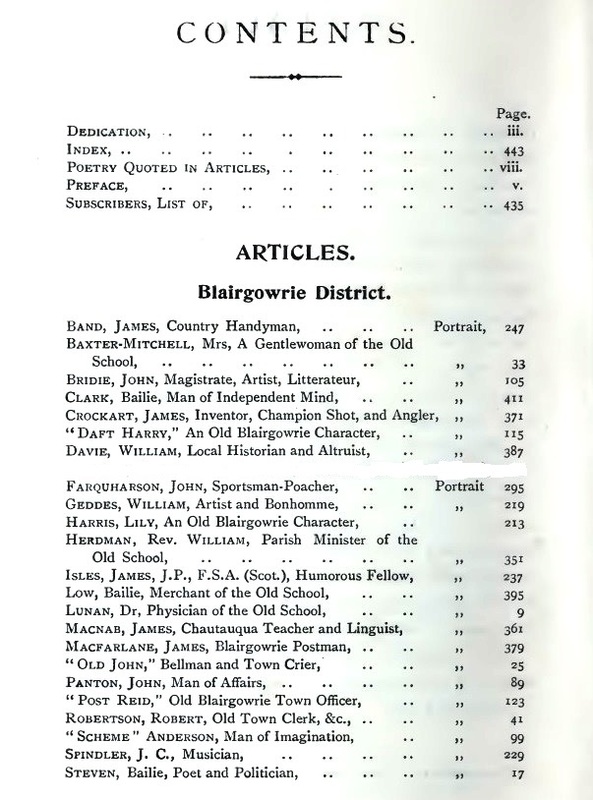 He is besides author and publisher of a Guide-Book for Blairgowrie and district, which is particularly notable among works of its class for its literary quality. Thank God, is nearly o'er. And don't you weep for what, my dear. Why did you heed them, dear ? O weary heart and weak! I cannot see—where are you, dear? 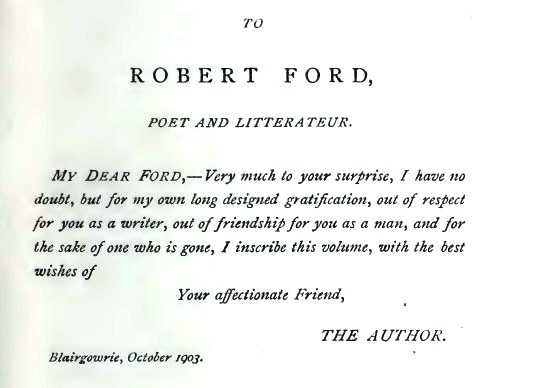 It must have been especially gratifying to the author of these tender and beautiful lines when recently, in a letter which he received from the famous Dr Robertson Nicoll in reply to a query about a totally different subject —-and the first he ever addressed to him — the busy editor of the "British Weekly" said he knew nothing about the matter in question, but he knew of a poem beginning — ’Come near me, dear; come near me, dear, I have not long to stay’— that was written by one of the name of Dryerre—it was over 30 years since he saw it—but if he was the author he should like to shake hands with him. The excellent piece—song or poem, as you like—I should say, is included in Mr Dryerre's handsome volume, "Love Idylls, Ballads, and Other Poems," published in 1884, and which embraces well over a hundred poems and songs which are scarcely less captivating and entrancing. The reception given to the book by the critics on its appearance, I remember, was, as it deserved to be, of the most encouraging character. Speaking for myself, I must say the ‘volume' ranks among half a dozen of its kind that I can return to more frequently with delight than to the many hundreds besides in my possession. His poetry Mr Dryerre writes with extreme fluency, composing on occasions three or four poems or songs of an evening, so that what he has published forms less than a tithe perhaps of what he has written. In the course of a letter addressed to myself many years ago, I remember, he said—“In anything I write, it is as a rule the assertion of my own genuine feelings, opinions, or fancies, my own experiences, and, in many cases, my own sufferings (lightly disguised) that find utterance in verse ; and were I to lay down a rule for writing poetry it would be—‘Utter’ what is within and fear not; it will reach a heart somewhere if it comes from your own. I have no sympathy with those who talk of potry as an art. The true poet, certainly, employs art as a means of expression, but the art itself is not poetry, and unless he has an impulse deeper than the mere desire to cut and carve images than the words, he is not a poet, at any rate.” That is well said, and forms the text perhaps of a work which I know he is preparing for the press, and will bear the title of "Ars Poetioa; a Vade Mecum for Young Poets." On the question which has been raging for some time relative to the authorship of the plays generally ascribed to Shakespeare, Mr Dryerre, as is well known, is a pronounced and stalwart Baconian, and his series of articles on the subject which appeared in the “People's Friend” in the spring of 1898 revealed how he could advance better reasons for his faith than by framing absurd cryptograms, and following the bent of others in America and elsewhere, who support the same view. I should like, did space permit here, to reproduce some of the stronger and difficult-to-refute arguments for Bacon which Mr Dryerre sets forth, but the subject is too intricate to be gone into in this hasty writing, and I refer those who are interested rather to the book Mr Dryerre has written on the subject, and which should shortly appear. Surely all that has been told here reveals Mr Dryerre as a giant among his fellows. And yet the half, I am persuaded, has not been told, because the man is greater and better than his work—because he is sweeter and more lovable in his personality than it is possible for cold print to show forth. Returning to his work, “The Worthies.” for a final word, I must not fail to say that of all he has accomplished, his very latest—that series of sketches which has run through the “Journal” on the “Strathmore and Stormont Worthies”—has been most generally esteemed, and will be longest cherished by the people of Perthshire, whose kindly feeling, I know, is very dear to his heart. The decision to issue a selection from them in book form is a wise one. It will prove a book, not merely for to-day and to-morrow, but for all time. Health and song for many years to genial, kindly, clever, Henry Dryerre!